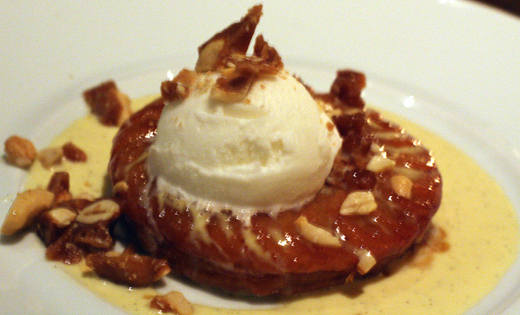 Dining at a Michael Mina restaurant is always an exercise in excess. In the best of ways, of course. After all, this is the chef who popularized the idea of trios, where it’s not simply enough to present just one rendition of a dish, but three different ones simultaneously on one plate. It takes skill, timing and sophistication to do that well. And that’s just what’s on display at Mina’s new Bourbon Steak in the Westin St. Francis San Francisco on Union Square. Bourbon Steak takes the place of the former Michael Mina flagship restaurant there, which has moved to the old Aqua restaurant space on California Street. The once chic white and eggshell blue 102-seat dining room has been transformed with a more masculine atmosphere with dark charcoal floor-to-ceiling columns and hues of deep cognac and sand. The logo of a steer can be found subtly echoed on the Mondrian-like window treatments and water is brought to the tables in whimsical glass milk bottles. This marks Mina’s fifth Bourbon Steak nationwide. And he has the formula down pat. 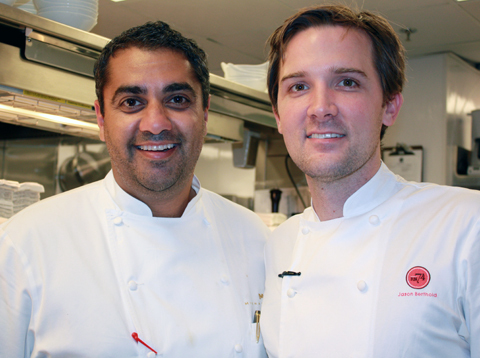 Executive Chef Omri Aflalo, who did an externship with Mina while at the Culinary Institute of America, is at the helm of the San Francisco locale. The broad menu includes some of Mina’s greatest hits, including his addicting lobster corn dogs ($16), black truffle popcorn ($15), and lobster pot pie (market price). Since it is a steak house, you’ll also find the likes of a 28-ounce Porterhouse for $68, an 18-ounce bone-in rib-eye for $42, and a 6-ounce Australian Wagyu strip (market price). 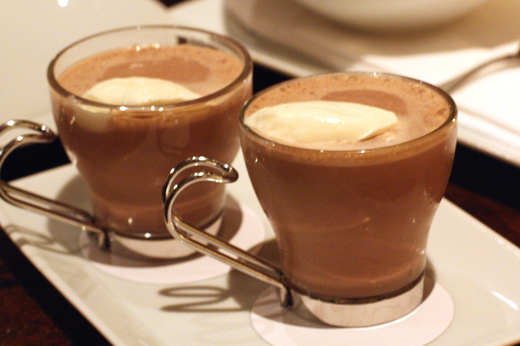 Recently, I was invited to dine as a guest of the restaurant to enjoy a special tasting menu. 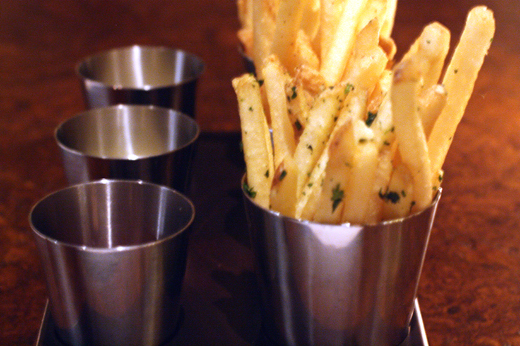 You know you’re in for something when the first thing that arrives at the table is a trio of duck-fat fries with a sour cherry ketchup, a smoked onion aioli that tasted almost of bacon, and a zingy yuzu sauce. You tell yourself you’re going to eat just a couple, but then you finish every one. Every restaurant should take a lesson in fries from Mina, as these are as perfect as they come. 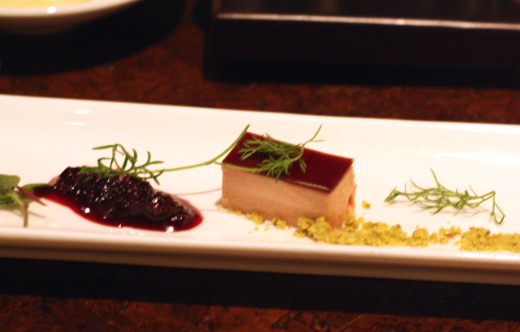 The decadence continued with a small rectangle of foie gras terrine with huckleberry glaze that just melted on the tongue. 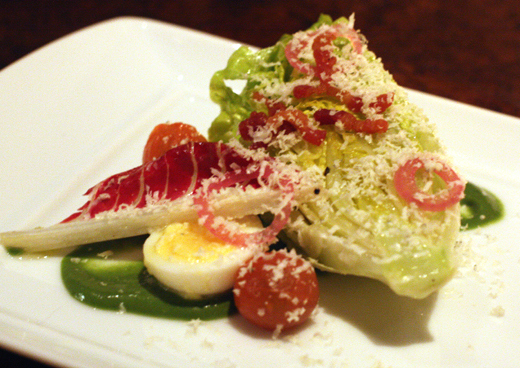 Next, a lightened, more refined version of a classic wedge salad. 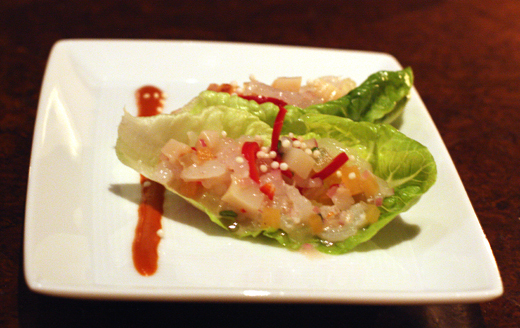 This one, with half a Little Gem lettuce head, drizzled with a take on Green Goddess dressing and shaved Pt. Reyes Blue. 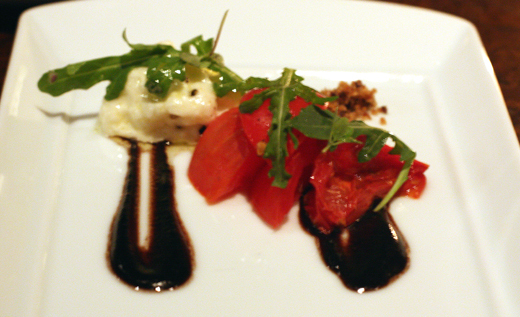 Alongside it on the plate were heirloom tomatoes with creamy burrata and a fantastic, salty, piquant black olive vinaigrette. On an accompanying plate were lettuce cups filled with Hokaiddo scallops and ebi, mixed with compressed sweet melon, mint and pickled onion. That was followed by lobster. 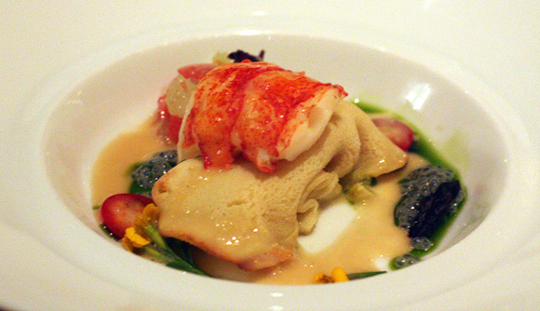 Not just any lobster, but butter-poached and sitting on a soft crepe filled with sweet corn kernels. A Thai curry broth gave it all a complex Asian flair. 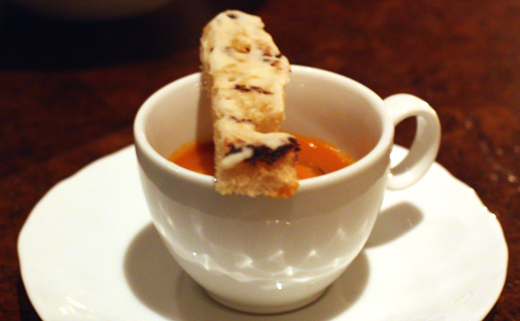 Alongside was the cutest cioppino ever — inside a demitasse cup with a sliver of a crouton balanced on top. Although the chunks of fish were very tender, the cioppino broth was surprisingly more like a sweet tomato soup. 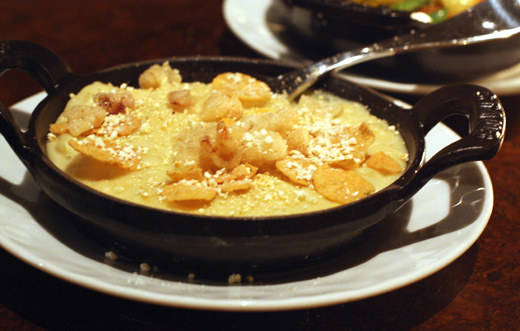 It made me think of a grilled cheese sandwich far more than a classic seafood stew. 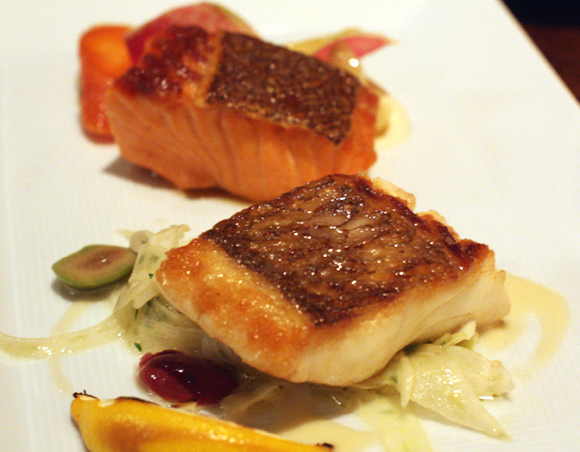 A duo of Tasmanian sea trout, the color of salmon but with a milder flavor, and Medai snapper showed just how well the restaurant executes fish dishes. The skin on each was as crisp as a potato chip, with the flesh as silky as can be. 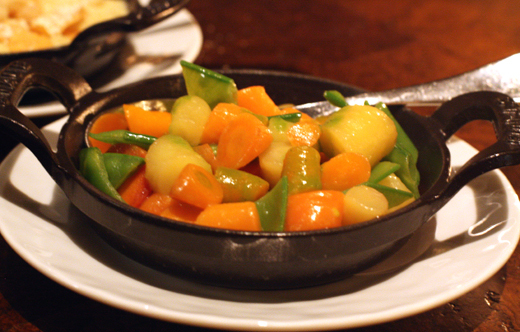 With it came sides: a small cast-iron skillet of sweet carrots and snap peas, along with another cast-iron pan of luxurious creamed corn that I don’t want to know the calorie-count of. Beef arrived three ways: an extremely marbled American Kobe flat iron steak that was incredibly rich, a tender America Kobe rib cap, and short ribs, which had been cooked sous vide for 72 hours. The latter were off the bone and cut into neat slices fanned out on the plate. 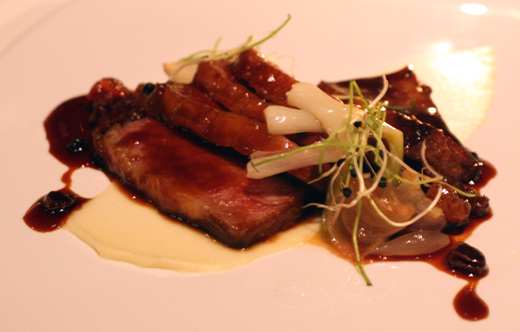 As Aflalo later explained, short ribs are sold in three parts — flap, flat and steak. The first two are what are usually found sold in Asian or conventional supermarkets. 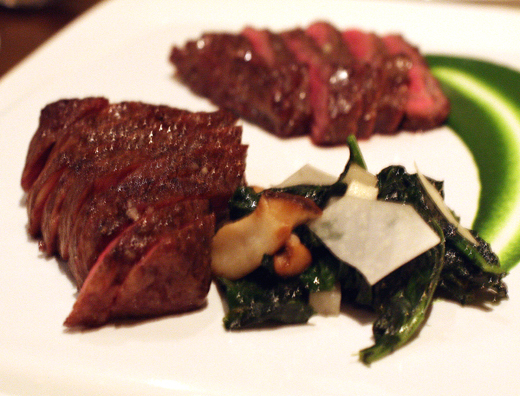 The steak, however, is what high-end restaurants such as Bourbon Steak prefer. Rather than a stringy texture, it has more uniformity. 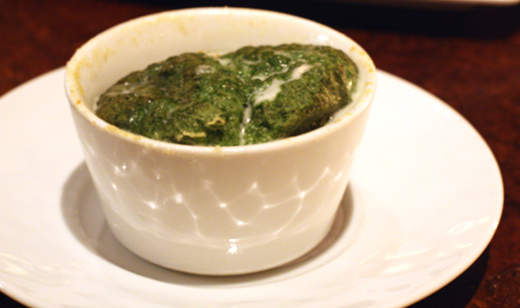 If all that beef weren’t enough, it was served with sides: a fluffy spinach souffle with Parmigiano cream poured into it tableside and a loaded baked potato. Was it ever. 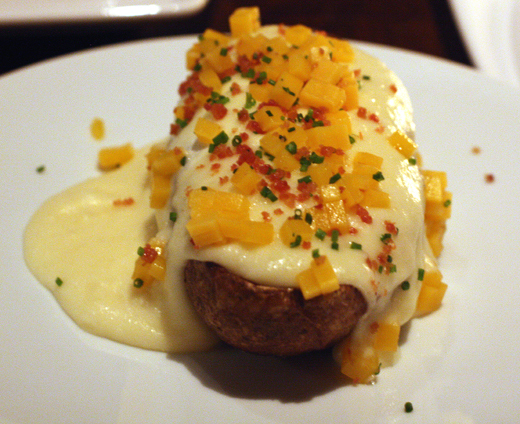 Picture a large baked potato and a waiter pouring pureed potatoes whipped with white Cheddar into it, then topping it with more orange Cheddar, bacon and chives. Yes, potato on potato action. And it was as good as it sounds. 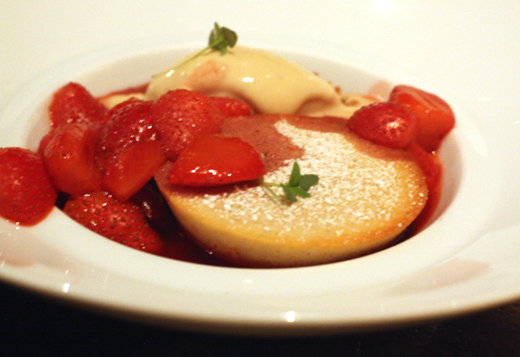 Not to be outdone, Pastry Chef Catherine Schimenti sent out four full-sized desserts. OK, the chocolate malt milk shakes were cute and small. 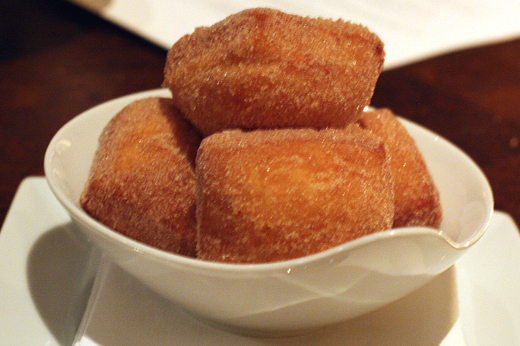 But the rest were regular-sized and very hard to resist: a classic almond financier with strawberry compote, a banana tarte tatin that was expertly flipped onto a plate tableside by the server, and cinnamon sugar beignets that were warm, addicting and some of the best I’ve ever had. The very last treat? 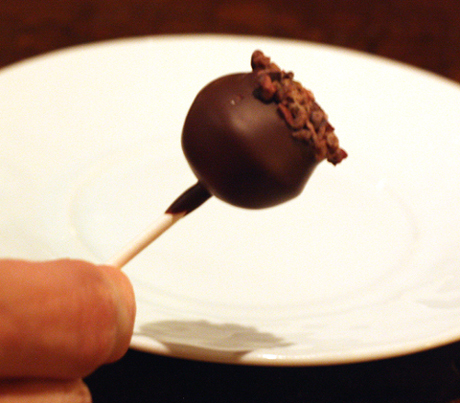 A caramel bonbon on a stick. I don’t know the last time I’ve been this full from a dinner. But at a Michael Mina restaurant, it’s all about excess that can’t be denied.